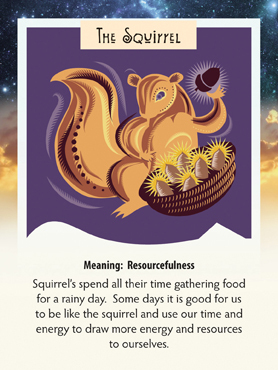 This week we have drawn The Squirrel card. It is interesting for me because I was quite ill last week and still recovering. At some point, you have to just say “OK, I’ll stop expending my energy and just rest”. That is kind of hard for me but important to recognize when it is essential. I needed to collect energy to myself. Perhaps it is a good week to clean out the cupboards and store up our essentials. If there was some kind of disaster, do you have enough supplies? I don’t mean to be doom and gloom by ANY means, but it is good to think of these things now and then. Look around and realize what is really valuable to you if you did have to dash from a fire or flood. It is really a short list if you think about it. So for this week, think about what you purchase…do you really NEED what you are buying. And have you taken care of your essentials, physically and emotionally. Do have a wonderful week and enjoy the treasures you have in your little den! I like what you said, “OK, I’ll stop expending my energy and just rest”. Never thought of it that way and certainly not in connection with a squirrel. Love that. One of our fall projects is to clean the clutter out of the attic. I was in there this weekend and could not believe how much crap is stored. How does this happen? Why are we storing this useless stuff? Gile still has his parachute and hang glider from your wonderful “jumping” days. Do you still have your parachute? Anyway good post, I know what you mean. We do tend to hold on to things! I have a piece of fabric from my hang glider and as far as the parachute goes, one of the “boys of that era” offered to sell it for me and kept the money himself! Those were the days! I have lots of photos and great memories of that time of great freedom!